March 21, 2002. At Utrom Base 59632 in New York Harbor (the “moon island”), Glurin receives notification that one of their research buoys in the Sargasso Sea has gone missing. The buoy was set up to measure Earth’s considerable global climate change brought on by mankind’s pollution and is thus of vital importance for the survival of the human race. Donatello asks to tag along for the trip and the two head for the Sargasso Sea in a Terran ship. Upon arriving, they launch a submersible from the Terran ship and go exploring underwater. Don and Glurin both leave the ship to swim with the many sea turtles and Don tells Glurin stories about how humans have been saved from drowning by sea turtles that have towed them to land. Glurin is incredulous. After getting back into the submersible and surfacing, they find the Terran ship has vanished. In its place is a 17th century Portuguese galleon. They decide to sleep on the galleon for the night and worry about getting home in the morning. As the sun rises, Glurin wakes first and goes back to the submersible, hoping to use the onboard computer to research the Bermuda Triangle legend he’d heard about. Suddenly, a strong current tugs at the sub and pulls it underwater. Don wakes up at the sound and dives overboard. He catches up with the sub and climbs inside. Glurin wishes he hadn’t, though, as the current is dragging the sub into the darkness and he can’t stop it. They pass sunken ships, a sea turtle graveyard and finally plummet down an abyss. They come face to face with a massive vortex with numerous ships and planes trapped in its event horizon. Glurin recalls the alien race known as the Voyadeen who long ago seeded the galaxy with autonomous survey vessels. The vessels were known to create miniature black holes (or in this underwater case, a “blue hole”) when their subspace wormhole drives malfunctioned. The sub continues to be drawn toward the blue hole, though Don notices that the sea creatures seem to be able to avoid the drag without problem. Don puts on scuba gear and he and Glurin eject from the sub, hoping to escape the pull by swimming. They fear they won’t make it, but a very large sea turtle picks them up and gives them a ride on its back. They awaken a few hours later on a small island. An Utrom rescue ship, having tracked their bio signatures, gives them a lift home. Don is happy they found that small island, or they surely would have drowned. One of the Utrom rescuers tells him that “island” is actually a very large specimen of Chelonia Mydas… the sea turtle. As the massive shell submerges, Don suspects that they were saved by the grandparent of all sea turtles. *This story takes place during the six month gap in TMNT (Vol. 4) #5. 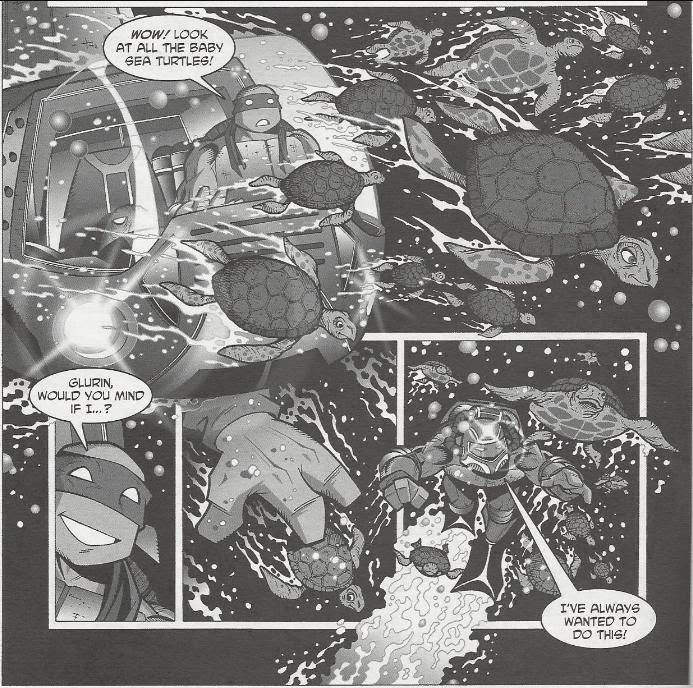 *Taking place in late March of 2002, that means this story occurs shortly before Tales of the TMNT (Vol. 2) #12, as that story takes place in April of 2002. *Chronologically, Glurin first appeared in Tales of the TMNT (Vol. 2) #42. *With the resources of the Utroms, Don had previously taken an interest in researching Earth’s global warming problem in Tales of the TMNT (Vol. 2) #16. 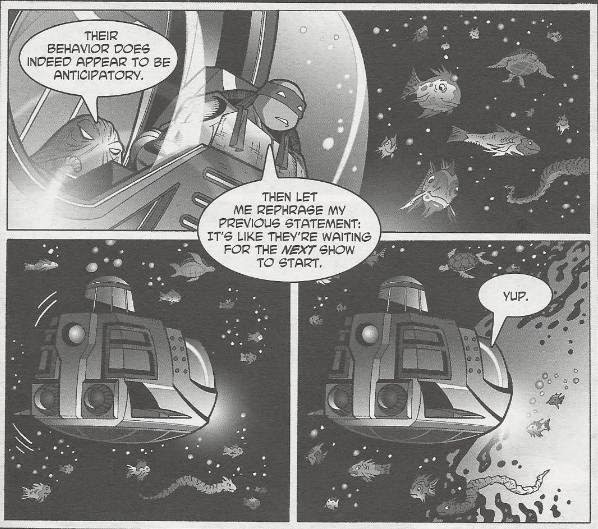 The reason the Utroms themselves are so interested in Earth’s climate change will be revealed in Tales of the TMNT (Vol. 2) #69. *A giant turtle possibly related in some way to this one was first encountered by Leo in TMNT (Vol. 2) #4. 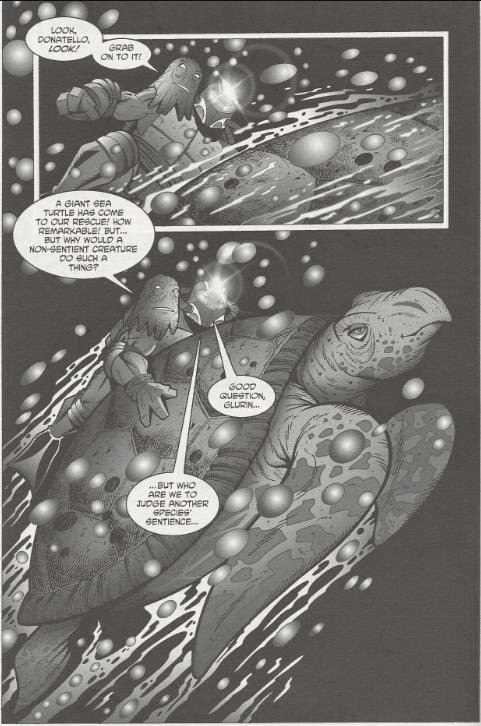 That race of giant turtles would be shown to have survived in the story “The Cure”. *Donatello's relationship with Glurin presents something of a continuity error. This story must take place during the six month gap in TMNT (Vol. 4) #5 due to the hard date given. However, in TMNT (Vol. 4) #7, Donatello doesn't recognize Glurin while he's working in a lab and had to have the Fugitoid introduce him. Other than ignoring the date and placing this issue later on during Volume 4, there's no real way around this one. *This issue also featured a back up story, “Altered Fates” by Murphy, Lawson and Talbot. 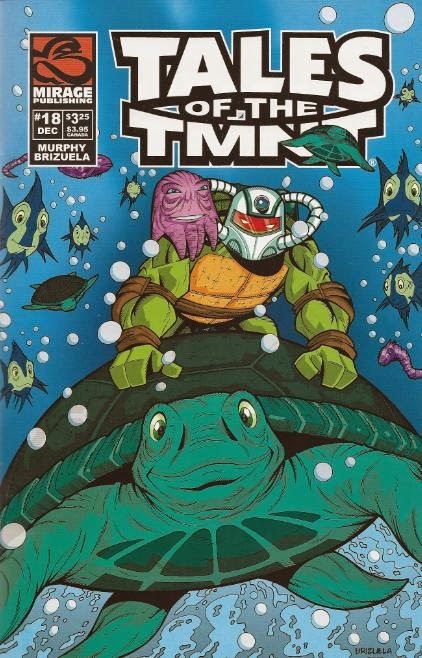 It seemed like there were a lot of Donatello and Utrom adventures throughout Tales of the TMNT Volume 2. Looking back, I think there were only four or five; not nearly as suffocating as I’d misremembered. The nice thing about these stories is that they show Donatello really, REALLY enjoying himself. He’s a scientist who has had to spend most of his life working with scraps in a sewer; no resources, no funding, no support from anyone. Now, he’s suddenly surrounded by high tech aliens with labs and equipment and vehicles and holy crap, he’s like a kid in a candy store. There are a bunch of these Donatello/Utrom adventure stories and almost all of them take place in that six month gap during TMNT (Vol. 4) #5. Condensed, yeah, but this is sort of Donatello living his wildest fantasy come true. You can’t really blame him for wanting to spend ALL his time on the moon island with the Utroms and doing research and going on scientific expeditions. It’s a miracle he ever even went back to the lair. I believe this is also our introduction to Glurin (in publication order, not chronological order), who’ll become something of a sidekick for Donatello as Tales Volume 2 proceeds. He doesn’t have much of a personality and, being an Utrom, his dialogue is really dry. It puts Donnie in an interesting position, as HE’S suddenly the life of the party, at least when compared to the plank of wood that is Glurin. Though I’m not hating too much on Glurin; Murphy will develop him a bit more and find a better voice for him. He’ll eventually kind of become this mad scientist guy whose “why would you BUILD that” inventions constantly get the Turtles and the whole universe in trouble. In this story, though, he’s just a highly interchangeable Utrom who exists to facilitate the adventure and provide exposition on the nature of the Bermuda Triangle when the moment calls for it. Reading this issue several years after plowing through the whole Mirage TMNT catalog for this site, I’m impressed by how much it works into the overarching tapestry of the universe in subtle and obvious ways. There’s the fact that it takes place smack dab during Volume 4, yeah, as well as Donatello building his relationship with the Utroms and Glurin. But there’s also the continuing story arc regarding the impending global warming catastrophe (love it or hate it). The “arc” of that background threat was always very subtle, but it was mentioned in a LOT of these Tales issues; be it as “global warming” or as something more ominous, like an impending doom foretold by a supernatural entity in a later issue. So when it all comes to a head in Tales #69, if you’ve been paying attention, that event won’t seem quite so random. Then there are the giant sea turtles. They’re an interesting callback to a very random two-issue story arc from TMNT Volume 2, where Leonardo does battle with a giant turtle in the sewers of New York (and kills it). It wasn’t a sea turtle in that story, I don’t think, but it was still this utterly random giant turtle that came out of nowhere. “The Blue Hole”, in a roundabout sort of way, explains the origin of that creature with this massive grandparent of all sea turtles. “The Blue Hole” is a bit of a bland story, but I’m impressed by how subtly it carries on arcs and ideas from all across the Mirage timeline. It has some valuable narrative setup for Don and his Utrom relationships as well as some excellent art from Dario Brizuela. There’s also the fact that you have to ignore the reality that Don and Glurin would have been crushed by deep sea pressure when they ejected from the sub, but whatever. I think in a vacuum the tale is rather dull and forgettable, but when looking at the big picture it’s pretty neat. Why must ever one of Murphy's stories always push some environmental agenda? ^ For the same reason every one of Peter laird's stories are sci-fi and Kevin Eastman's deal with urban and gritty gangs and mobsters shooting each other. Read enough of any TMNT writer and they always deal with the same themes over and over again.